CANSI instructors on the Interski 2019 Canadian team need your support to cover some of the costs associated with participating in this major international ski instructor congress (Pamporovo, Bulgaria, March 2019). They have decided on a formula that combines the useful with the fun: a day of ski technique development for CANSI instructors! For details and registration please read on. Donations for the Marie-Cat Bruno Special Fund are intended to financially help women pursue their goals in the Nordic ski industry. It is to continue the legacy of Marie-Catherine Bruno that CANSI created this fund. A former racer, Marie-Cat was the first and, to this day, only woman to have achieved the highest levels of certification in both cross country and telemark ski instruction. Through her involvement as CANSI-Pacific Technical Rep, she successfully contributed to develop and maintain the highest standards in Nordic skiing technique and instruction at the regional and national levels. Help make CANSI Ontario work better! Join us for the CANSI Ontario AGM on Saturday June 2, 2018 at Horseshoe (near Barrie), or join remotely via internet. Please visit the registration page for more meeting details and to register. See Ontario AGM for a list of directors, agenda, minutes and director reports. With his bright smile and smooth skiing, Shane has become the 5th CANSI Master Instructor after Keith Nicol, Mark Simpson, Marie-Catherine Bruno and Guy Paulsen. He is also the youngest one to achieve this elite status, an accomplishment he can rightly be proud of. Shane achieved his X-Country level IV instructor certification last February at Silver Star on a course conducted by Marie-Catherine Bruno. A Telemark racer on the international scene, Shane was also a Telemark level III instructor since April 2016. He lives and skis at Silver Star, BC. As part of CANSI’s strategic plan to attract and retain members, we have identified the need to improve our website. This year we will be working to make our website more user friendly, accessible via smartphone and computer, and easier to navigate to find the information that is important to you. We want to thank Mountain Equipment Coop for their help with this initiative. MEC provided CANSI with $20,000 through their Community Improvement Grant. Please help us show our gratitude to MEC by visiting a store in your area or online. The 2016-2017 Annual General Meeting of the Canadian Association of Nordic Ski Instructors will be held at Auberge Château Bromont, 95 Rue de Montmorency, Bromont, QC on February 28, 2018 at 5:00 pm. You will find complete details on the 2016-2017 AGM page, including the agenda, proxy form and official documents. Please check on a regular basis as the page will be updated over the next few weeks. Here’s your chance to ski with the PSIA Telemark Team in April at Montana’s Big Sky Resort. The PSIA has kindly allowed a limited number of CANSI Telemark instructors to participate in the Telemark Academy. PSIA Telemark Team members Grant Bishop and Gregory Dixon will lead you through three days of big mountain skiing, skill improvement, teaching progressions and drills, and more. 2017-2018 National Seminar in Quebec was a success! Read on for story and pictures. Announcing the 2018-2019 National Seminar in Silver Star, BC March 4-8, 2019. Watch the video for a taste of your next snow holiday! Donations for the Charles Blair Interski Scholarship are intended to financially help selected instructors who will represent the association at Interski. Interski, the international convention for ski instructors, takes place every fourth year in the most famous ski resorts across the world. It is to honor the memory of Charles Blair that CANSI created this fund. Charles was part of the CANSI demonstration team at Interski 2015 in Patagonia. He generously shared his experience with the association and structured CANSI’s efforts to organize the training and preparation of instructors for next Interski’s demonstration team. It is with a profound sense of loss that we announce the sudden passing of our friend and colleague Charles Blair. Charles died of a heart attack while visiting with his daughter in Atlanta, Georgia. He was preparing for a winter of teaching skiing in Japan. All of us at CANSI are shocked and saddened by this sudden turn of events. To know Charles was to love Charles, for he had the special ability to connect instantly with anyone he met. His dry sense of humour made it impossible not to laugh at some point in every conversation shared with him. His outwardly bookish appearance disguised a determined and dedicated athlete, student and teacher. The achievement of the CANSI Telemark Level III certification did not come easily for Charles, but his tenacity and perseverance allowed him to achieve this prestigious honour in 2013. All of those who skied with Charles know how much the achievement meant to him. It’s snowing in the West of the country! Start your 2017-2018 season today and renew your CANSI membership! Click here to renew, and read on to review your benefits as a member. CANSI Pacific in cooperation with the Whitewater Ski Resort and Coldsmoke Powder Festival is pleased to announce the Western Telemark Workshop at Coldsmoke Thursday February 23, 2017. Join us in the West Kootenays for a full day of sessions presented by CANSI’s top Telemark Instructors and Course Conductors for the incredible price of $120 including your full day lift ticket. This workshop is open to all CANSI Telemark Instructors - there will be something for everyone. Come for the workshop, and stay on for the Coldsmoke Powder Festival! Click Here to Register now, as the capacity for the workshop is limited. Whitewater Ski Resort and the 11th Annual Kootenay Coldsmoke Powder Festival welcome CANSI members gathering for the Tele Seminar on February 23! We’d love it if you would stay a few extra days and join us at Whitewater for Coldsmoke running February 24-26!! The 2015-2016 Annual General Meeting of the Canadian Association of Nordic Ski Instructors will be held in the meeting room of the Alpine Club of Canada, 201 Indian Flats Rd, Canmore, AB on November 26, 2016 at 6:30pm. You will find complete details on the 2015-2016 AGM page, including the agenda, proxy form and official documents. Please check on a regular basis as the page will be updated over the next few weeks. Start your season off on the right ski by attending the 2016-2017 National Seminar in November at Canmore! Register here for the X-C seminar (read the preliminary seminar program), for the X-C Course Conductors briefing (read the briefing program) and for the AGM. The Telemark briefing and seminar had to be cancelled due to low registration and to difficulties for several national Course Conductors to attend but there will be a group of CANSI Telemark instructors skiing together. To join please email president@cansi.ca. Here is a video from the latest Telemark level II-III certification course held at Silver Star, BC, March 28 - April 1, 2016 and led by Denis Vézina. Please join us for the Ontario Region Annual General Meeting (AGM) on the evening of Saturday June 4, 2016 at the Horseshoe Valley Resort, Ellesmere Room - the same location as last year. For direction see this map. This is your chance to meet the people who make CANSI Ontario work and help make it better. This winter Ontario awarded another youth scholarship. It was to Alan Godbout who passed a very challenging 3-day Telemark Level I course at Devils Glen Ski Club mid-March. Here are Alan’s words of this experience. Recently, I passed my Telemark Level I Course. It was nothing like my Alpine Level I Course. In that course, everyone was my own age and we learned to teach young kids through games and imitation. In this course, the next youngest participant was double my age. Stephanie, who was 29, probably could have passed the course without even taking it. The rest of us really had to work at it. Aside from me, the rest of the participants were in their 50’s and 60’s. Registrations are now open on the Courses page for the Seminar, the CC Briefing and the AGM. Read all details on seminar.cansi.ca. Please join us for the Ontario Region Annual General Meeting (AGM) on Sunday May 24, 2015 Horseshoe Valley Resort, Ellesmere Room. To find out how to get there see this map. This is your chance to meet the people who make CANSI Ontario work and help make it better. Ideas and energy are both welcome! The western training day for InterSki took place at SilverStar BC, on April 4. The eastern training day took place April 12 at Mont Blanc in the Laurentians. Together, to the next level! Register early and you may win a complet set of Rossignol XC X-ium equipment! The winner will be announced on January 27th. They will then be able to choose their skate, classic or backcountry skis, bindings, boots and poles. · All that at the lowest possible cost! · Airport (or train or bus station) group shuttles will take you and your luggage to and from the official hotel on the main travel days and times. Select those you want when registering and email your travel info to office@cansi.ca. · Daily shuttles will take you and your gear from the hotel to the various session locations and back. Select when registering. · Sharing a hotel room: to help you find roommate(s) CANSI is providing registrants with access to a private page of our online Basecamp. · Onsite facilities: Telemark Seminar participants will have access to space in the ProRoom at Camp Fortune. XC Seminar participants will enjoy the use of Relais Plein Air, a dedicated XC facility right on the trail network. · Lunches: Telemark participants will have access to resort cafeterias. XC participants will be offered wholesome, homemade hot lunches for a modest cost. Select when registering. Please contact office@cansi.ca for any diet requirement. Register now for your worry-free Seminar and make sure you don’t miss the early bird deadline and enter the draw! The CANSI uniform order is ready to go. We have been struggling with availability of garments in red that would be suitable for the CANSI logo. We only have a two week window to get the order processed so please don’t delay as stock is very limited. It is time to get your Uniform Order in for this winter’s season. We are again partnering with Arc’teryx to provide uniforms for CANSI instructors. The uniform pieces will be delivered in early January from the Dec 15, 2013 order. Message 3 - Finally! Here is most of the information that you need to register! See the following document CANSI SEMINAIRE NATIONAL INFO Rev.docxfor the dates, costs, preliminary agenda and more! CANSI Ontario is pleased to offer again a scholarship to any youth between 16 and 21 years of age at the start of a CANSI Ontario course. For details how to obtain this scholarship, please read this Ontario Youth Scholarship policy page. Here are some details from the two Youth Scholarship recipients from last winter. Message 2 - The first three days of the seminar will be dedicated to cross-country skiing with the CANSI AGM on the Wednesday night and the last three days dedicated to telemark. There will be morning and afternoon sessions along with social events at night. Have a say in shaping the seminar by providing us with your thoughts on what type of sessions you would like to attend. You can send your feedback to office@cansi.ca. Note that just prior to the seminar, CANSI instructors are invited to participate in the Gatineau Loppet, Canada’s largest cross country ski event, which will be held in the Gatineau Park from February 15-16th and just after the seminar instructors are also invited in participating in a telefest which will be held nearby. Message 1 - Mark your calendars! The 2014 CANSI National Seminar will be held in the National Capital Region from February 17-21 2014. The organizing committee is working very hard and will have more information for you in the coming weeks! Keep checking the website or our Facebook page for more information. See you soon! Scheduling for CANSI Telemark courses in Ontario is underway. Courses in Southern Ontario are open for registration now. Stay tuned for courses in other areas. Please join us for the Ontario Region Annual General Meeting (AGM) on Saturday May 25, 2013 at the Barrie Public Library on 60 Worsley Street in downtown Barrie. To find out how to get there see this map. This is your chance to meet the people who make CANSI Ontario work and help make it better. At 12 noon we will have an informal get-to-know-your-board lunch. The AGM meeting will start officially at 12:30 p.m. We will also try to have a live web connection for people with decent Internet connection who cannot attend this meeting physically. Connection details will be sent to individuals who registered for this AGM and selected the “Virtual Meeting” option. CANSI National Seminar 2013- Silver Star B.C from CANSI on Vimeo. Most of the Atlantic courses are now online and ready for registration. Some dates still need to be confirmed so stay tuned and check often for new entries in the calendar. Please join us for the Ontario Region Annual General Meeting (AGM) on Sunday May 27, 2012 at the Swansea Town Hall on 95 Lavinia Avenue in west end of Toronto. This is your chance to meet the people who make CANSI Ontario work and help make it better. At 12 noon we will have an informal get-to-know-your-board lunch. The AGM meeting will start officially at 12:30 p.m. For more info and to register click here. The latest information for the CANSI National Seminar January 18-22, 2013 at Silver Star, BC will be posted on this page. The headquarters for the National Seminar at Silver Star will be the National Altitude Training Centre (NATC) in the village. All sessions will start from this location. Registration & Check-In for the XC National Seminar opens at the NATC 8:00am Friday, January 18. Registration & Check-In for the Telemark National Seminar opens at the NATC 8:00am Sunday, January 20. Silver Star has arranged for registered National Seminar participants to purchase trail and lift passes at 50% off the normal day rate. Please bring your CANSI membership card and present it at the ticket window in the village. MAKE SURE YOU HAVE YOUR TRAIL/LIFT PASS BEFORE THE SESSION STARTS. You can download the entire information package here - a printed copy will be waiting for you when you register. One of our own is a finalist in the Powder Highway’s Ultimate Ski Bum Contest. Due to strong demand this year for uniforms Arc’teryx is going to batch the application of the appliqué logo. To make sure you have a uniform for this winter please have your order in by Dec 15th and please be careful to follow the directions on the uniform page when ordering. The uniform pieces will be delivered by early January. If you are going to the national seminar it may make sense to have the uniforms delivered to the national seminar site. If you are ordering a uniform and you would like to do this please contact prodeal@cansi.ca. A new appliqué logo that obviates the need for the embroidered logo and the resulting holes in the garment and the associated seam sealing. As well as being roughly 75% less than the previous logo cost! New less stiff fabrics in the two shell jackets, now 510NP GORE-TEX® Soft Shell 3L. This is a 3 Layer Gore Pro Shell fabric with a a very light brushed lining that enhances the breathability of the garment and the overall feel. A brighter red in all the garments that enhances on hill visibility. Order early to ensure you get the sizing* you want. *The SabreSV runs fairly large, I am 5’9” and 175# and a medium is plenty large. Pants are true to size, as are the softshell garments. CANSI sent a team of skiers with the Canadian team to this year’s Interski in Austria to represent the Nordic side of Canadian ski instruction. Most of the Quebec courses are now online and ready for registration. Some PDD and course dates still need to be confirmed so stay tuned and check often for new entries in the calendar. For the 2010-2011 ski season, CANSI Ontario is again happy to offer financial support to young instructors or those who target young people from 16 to 21 years of age residing in Ontario. Help make CANSI Ontario work better. Join us for the Ontario Region Annual General Meeting (AGM) on Sunday May 30, 2010 at the Swansea Town Hall on 95 Lavinia Avenue in west end of Toronto. At 12 noon we will have an informal get-to-know-your-board lunch. The AGM meeting will start officialy at 1:00 p.m.
More info and to register click here. Telemark Ski Ontario & Ski Telemark Ltd. are pleased to present the 2010 Race Series. Classes for all ages - Fun for all - Early Bird Registration by Jan 17, 2010. Day 1 (January 6, 2010) : Chalet des Voyageurs* at 8:30 AM. Day 2 (January 7, 2010) : Green lifts light board on the summit at 9:30 AM. Day 1 (January 8, 2010) : Chalet des Voyageurs* at 8:30 AM. Day 1 (January 8, 2010) : Accueil St-Bernard** at 9:00 AM. Day 1 (January 9, 2010) : Accueil St-Bernard** at 8:30 AM. Day 2 (January 10, 2010) : Accueil St-Bernard** at 8:30 AM. * The Chalet des Voyageurs is located just right of the base of the Cabriolet lift on the South side of Tremblant. Members who registered before noon on January 4, 2010 will pick up their discounted lift tickets then. CANSI’s Annual General Meeting (AGM) was held on Friday January 8th at 19:00 at Ski de fond Mont-Tremblant. A casual get together with snacks began at 17:30. Details, agenda and reports are available in the AGM portion of the Members Area. The Members Area has been updated with information on the latest official uniforms and great Pro-Deals. Check it out now! We are pleased to announce that Telemark courses being offered by CANSI Ontario for the 2009-2010 season are now open for registration. See the Courses page for the list of upcoming courses. You can request a custom program to fit your own dates if you have 4 or more people. Email us with your information and we will get back to you. In the fitting Telemark boots article there is an incorrect link to a video with Paul Parker and Mitch from Telemark Tips. The most up to date version of this article with the video embedded in it is available at Telemark Boot Fitting. The 26th Edition of the Mont-Comi (Quebec) telemark festival is again looking for volunteer Instructors for its clinics. The telefestival will be held from February 13 - 15, 2008. For more information and to register, contact Pascal Soucy. Note that you must be able to speak French since over 80% of the participants are francophone. Ontario course registration and cancellation policies are similar over the past several seasons. Here is a reminder what they are for this winter and beyond. The Telemark courses being offered by CANSI Atlantic for the 2008-2009 season are now open for registration. See the Courses page for the list of upcoming courses. Please email NSTelemark for more information. The 2008-2009 Course schedule for CANSI Pacific Region is now updated and online at www.cansi.ca. Contact us if you are interested in organizing a custom course for your ski school or other group - we can easily set these up with advance notice. CANSI Mountain Fiesta! - AN EVENT NOT TO MISS! We’re calling it a Fiesta because it’s not just a refresher or a briefing or an AGM - it’s all those and more combined into one event. And the best part?… IT’S FREE! 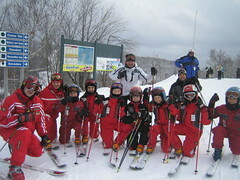 The Telemark courses being offered by CANSI Ontario for the 2008-2009 season are now open for registration. The Canadian Ski Instructors Alliance (CSIA) holds annual conventions for their members at the start of the season. The conventions take place at Lake Louise in the west, and Mont Tremblant in the east, and allow alpine ski instructors to improve their skiing and teaching skills by signing up for modules covering a wide range of topics. At this year’s convention, CANSI Telemark instructors will be presenting Introduction to Telemark Skiing as one of the half day modules. One of the big challenges facing the sport of telemark skiing is how to get young people involved. Norman Thibault, a Telemark Level III instructor from CANSI Quebec has found a way to do this. Norman and two others formed a non-profit organization called “Telemark Laurentides” as member of Telemark Quebec. In the 2007-2008 season, CANSI Ontario awarded Youth Scholarships and Youth Development Grants totaling over $2,000. These funds were awarded in the form of refunds of course fees for successful completion of CANSI courses, and funds to help cover expenses for delivery of programs benefiting people residing in Ontario in the age range 16 to 21. If you have an idea for a XC or telemark skiing related project that benefits young people residing in Ontario in the age range 16 to 21, prepare a proposal outlining your project, and send it to CANSI Ontario for consideration. Welcome All Telemark Skiers to TELEFEST 2008! Inclusive of lift ticket, luncheon, clinics, event entry, awards/prizes and much more! As announced in our earlier news item, this winter the National Technical seminars are being held in Ontario, in Collingwood area. Here are some more details. On Saturday December 8, almost 60 telemark skiers converged on Mount St Louis Moonstone, near Barrie, for Ski Telemark’s annual Telemark Warm Up Day Event. The 2007 Annual General Meeting for the Canadian Association of Nordic Ski Instructors (CANSI) will be held on Saturday January 12, 2008 at Highlands Nordic, Duntroon (Collingwood area) Ontario (www.highlandsnordic.on.ca). All members are invited to attend. For further information please contact president@cansi.ca. The Quebec coordination committee is proud to announce the 2007-2008 Telemark course schedule. The National Seminar will be held in the East this year. The Quebec coordination committee would like to have a strong presence from Quebec members this year. CANSI Ontario is again happy to offer financial support to young instructors or those who target young people from 16 to 21 years of age residing in Ontario. F3 Distribution has a few pairs of Karhu skis from it’s demo fleet that it is making available to CANSI members. The CANSI National Seminar is held annually, with the location alternating between Western and Eastern venues. Last year’s seminar was held in SilverStar, BC, and this year, the location shifts to Ontario at Highlands Nordic from January 10 through January 14, 2008. CANSI Uniforms for the 2007-2008 season are being supplied by Avalanche, a Canadian manufacturer of high quality skiwear. Ottawa, and Southern Ontario regions. 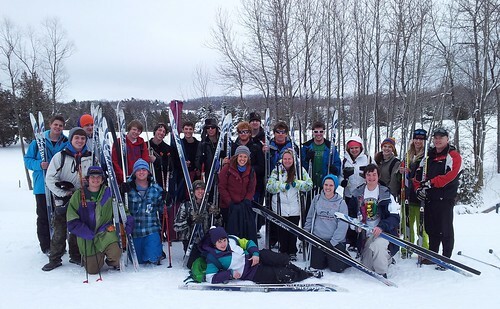 The Ski Telemark Reunion event held at Devil’s Glen Country Club on February 25 drew telemarkers from far and wide, old and many new, young faces, a count over 65! The day’s energy was released with the New Roteffella Telemark Norm being introduced for testing with new Crispi boots, high performance clinics for all, women only and juniors. The afternoon GS race was forerun by Rossignol’s newest advocate Mario Guertin and four classes, male and female were awarded Telemark Ontario medals for their outstanding performances! meet new tele skiers from across Ontario. This event commemorates the remarkable life of Mike Moran whom endeared many to the mastery of telemark skiing and it’s joys! • apres ski and more! When it became clear that the early winter weather would not deliver sufficient terrain to run a Telemark Level II course scheduled for Calabogie Peaks, near Ottawa, CANSI Ontario scrambled to find alternatives, and found a solution by moving the course to Mont Tremblant Quebec. CANSI is looking for volunteers to work on the Telemark Ski Your Best Project. The project’s goal is to produce an instructional program administered by CANSI-certified instructors to skiers who want to improve their technique, but who don’t want to become certified instructors. Participants achieve different levels based on the skills they demonstrate in different telemark maneuvers. The different levels are designed to be motivational for students, while giving instructors objective skills criteria for dividing students into lessons. Keith Nicol (Atlantic Technical Committee rep, Tele Level III and X-C Level IV) has a web site with numerous excellent tips. 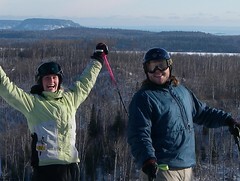 See them at http://www.swgc.mun.ca/~knicol and click on Nordic Ski Tips. Daytime temperatures reaching +12c caused the cancellation of some courses in Southern Ontario, but on Sunday, December 17, a Telemark Refresher course was held at Mount St Louis Moonstone, north of Barrie. Telemark Level I preparation, Level I certification and refresher courses are being offered by the University of Calgary’s Outdoor Centre at Nakiska this season. For more information and online registration, consult the Outdoor Centre web site or call them at 403-220-5038. The National XC (Nov 30-Dec 1) and Telemark (Dec 3-4) Seminars will be held at Silverstar, BC. Last season CANSI Ontario offered a Pro Deal on Karhu products. Due to changes in the ownership of Karhu, the distribution channel has changed, and at the present time, we can no longer offer this program. However, the previous distributor has a limited amount of demo XC and telemark and XC racing skis that they are offering to our members at a generous discount. Please contact info@ontario.cansi.ca for details. We have the dates set for the courses we are offering for the 2006-2007 season. See the courses page. You can register for these courses on-line. Greetings all. In case you have not heard, it is with great sadness that I must inform you that Mike Moran - CANSI Ontario’s master course conductor, a very generous teacher and talented Nordic skier - has just passed away this Saturday morning (around 9 am) in Barrie’s hospital.